Last week I was privileged to be invited to the NSW Aboriginal Education Consultative Group’s (NSW AECG Inc) NAIDOC celebration. NAIDOC Week celebrates the history, culture and achievements of Aboriginal and Torres Strait Islander peoples. 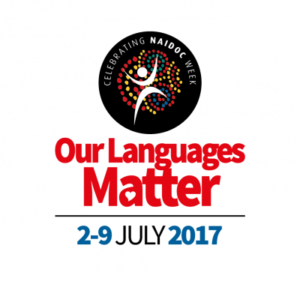 This year’s theme is Our Languages Matter. The celebrations began with dance and song, including a group of young women from the Redfern Dance Co.
Dr Shayne T Williams spoke about the history of Aboriginal Languages in Australia and the colonial move to obliterate them. He was followed by Raymond Ingrey who described the Dharawal Language reclamation project, which focuses on preschoolers at La Perouse but includes parents too. Their aim is to build a generation of bilingual people who are able to walk in both worlds. STEM camps for Aboriginal students in remote and regional NSW. It was great to be part of this year’s NAIDOC celebration and to learn more about Aboriginal Language and Culture reclamation. It also gave me another opportunity to applaud the fine work of the NSW AECG.